If America descends into Greek-style fiscal chaos, there’s no doubt that entitlement programs will be the main factor. Social Security, Medicare, Medicaid, and Disability are all fiscal train wrecks today, and the long-run outlook for these programs is frightful. Just look at these numbers from the Bank for International Settlements and OECD to see how our fiscal future is bleaker than many of Europe’s welfare states. If we don’t implement the right kind of entitlement reform, our children and grandchildren at some point will curse our memory. But that doesn’t mean we shouldn’t worry about other parts of the budget, including the so-called discretionary programs that also have been getting bigger and bigger budgets over time. …there is another number to look at in that budget. It’s the shrinking share of the budget consumed by discretionary spending (spending on things like defense and infrastructure) to make space for mandatory spending and interest. This is the Big Squeeze. …in FY 2014 mandatory spending plus interest will eat up 67 percent of the budget, leaving discretionary spending with 33 percent of the budget (down from 36 percent in FY 2012). Now by FY 2023, mandatory and interest spending will consume 77 percent of the total budget. Discretionary spending will be left with 23 percent of the budget. 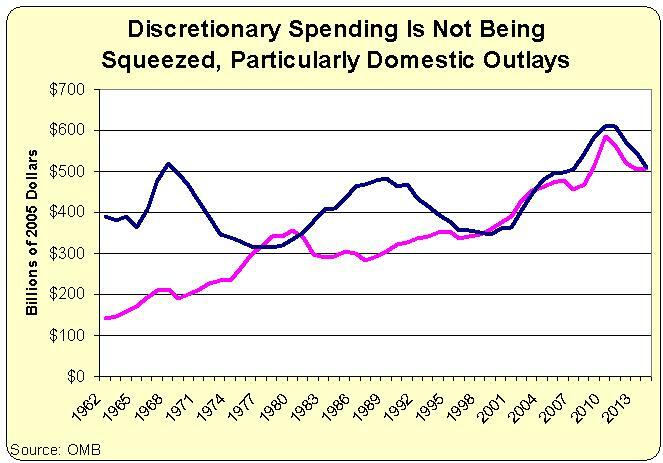 But all that’s really happening here is that entitlement outlays are growing faster than discretionary spending. Here’s some data from the Historical Tables of the Budget, showing what is happening to spending for both defense discretionary and domestic discretionary. And these are inflation-adjusted numbers, so the we’re looking at genuine increases in spending. As you can see, defense outlays have climbed by about $100 billion over the past 50 years, while outlays for domestic discretionary programs have more than tripled. If that’s a “Big Squeeze,” I’m hoping that my household budget experiences a similar degree of “shrinking”! To be fair, Veronique obviously understands these numbers and is simply making the point that politicians presumably should have an incentive to restrain entitlement programs so they have more leeway to also buy votes with discretionary spending. But I’d hate to think that an uninformed reader would jump to the wrong conclusion and decide we need more discretionary spending. Particularly since the federal government shouldn’t be spending even one penny for many of the programs and department that are part of the domestic discretionary category. Should there be a federal Department of Transportation? A federal Department of Housing and Urban Development? A federal Department of Agriculture? No, NO, and Hell NO. I could continue, but you get the idea. The burden of federal government spending in the United States is far too high and it should be reduced. That includes discretionary spending and entitlement spending. P.S. Since I don’t want to get on Veronique’s bad side, let me take this opportunity to call attention to her good work on properly defining austerity,. And if you watch her testimony to a congressional committee, it’s also quite obvious that she also understands that the real problem is bloated and wasteful government spending. Even entitlement spending by itself will eventually be more than revenue. The page has an interactive graph of future US debt and finances where various assumptions can be altered, e.g. using papers that indicate GDP growth may slow as national debt increases. The way to limit Discretionary Spending is to provide legislators with an all-or-nothing annual bonus of approximately 2x salary, if spending is kept under 7% of GDP. This will cost approximately $200 million, to cap Discretionary Spending in excess of $1 trillion. Right now, there is no downside to excessive spending. Since they work for us, we should reward them for limiting the size of government. We must reorient their personal incentives. The biggest challenge is the revival of an aging, shrinking, dying, white people under assault from non-Whites. this isnt an ideological battle of left vs right, GOP vs Dems, Socialism vs liberty. This is ethnic war against white people. Why are hostile globalist elite defending Israel as a Jewish ethnostate with Jewish only immigration, but ravaging white majority Europe/North America into a multi-ethnic, multi-cultural Gulag with dystopian non-White colonization? Why do gullible Whites kowtow to murderous Jewish/Crypto-Jewish commissars, who butcher White soldiers in bankrupting wars, confiscate White people’s guns, infiltrate & subvert our banks & spying agencies, indoctrinate White children in academia/mass media, & plunder White jobs, wages? East Asia is 99% yellow. Africa is 90% Black. West Asia is 99% Brown. But 3rd world colonizers are annihilating Whites, just as China is swamping Tibet. Genocidal Jewish commissars murdered 100 million White Europeans from 1917-1991. Jews exterminated countless tribes since Old Testament. “Native” Americans are not native. They invaded from East Asia. They slaughtered countless women/children. Muslims, Jews, China, India, Mayans, Africans all are guilty of slavery, genocide. From Greeks till today, Whites have been victims of Jewish, Turkic, Islamic, African slavery, genocide, imperialism. Gullible Whites should reject subversive Jewish ideologies – libertarianism, feminism, liberalism, socialism, & reject hostile slanders of racism, collectivism. I’m 52 and as I’m the tail end of the baby boom, I have planned from the beginning that Social Security and Medicare would not be there for me. Means testing of these programs will take place sometime in the next fifteen years or these programs will bankrupt the government, and by extention all of us. Anyone with any savings should not expect to receive social security. Or at least your payouts will be subtracted by the amount of savings you DO have.